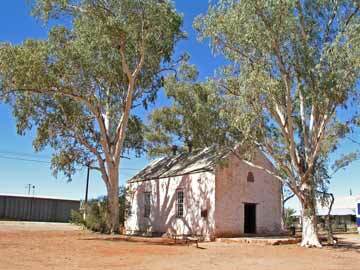 We depart The Alice and go along Larapinta Drive to the Reverend John Flynn's Grave. Flynn was the man who established the Royal Flying Doctor Service. This has a huge round rock as part of the memorial. From here we go to Simpsons Gap. This, like all of the sights along Larapinta Drive, is very nice. 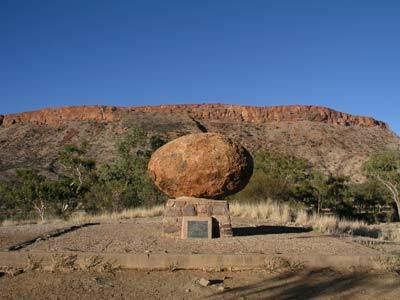 About 56 kilometres from Simpsons Gap there is a lookout just as the road drops down into a sort of valley. This gives fantastic views of a fair bit of the West McDonnell Ranges. 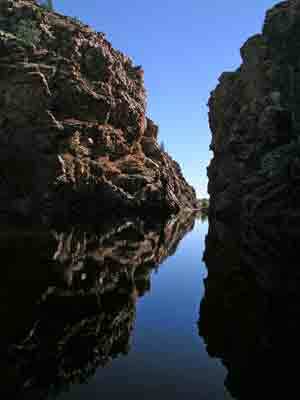 From here we travel the short distance to the Ellery Creek Big Hole. Again, this is an excellent spot. It has a very nice camping area as well. We have morning tea here. After this we go to Serpentine Gap. Here we do a couple of walks. One was a quite hard (but not too long) walk to the top of the gap. There are excellent views from here. We then have lunch. 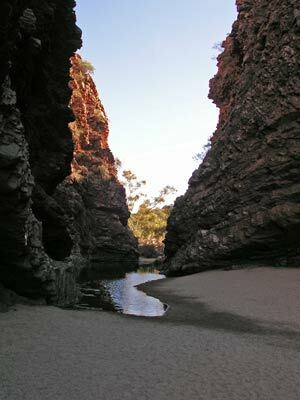 After lunch we go to Ormiston Gorge. 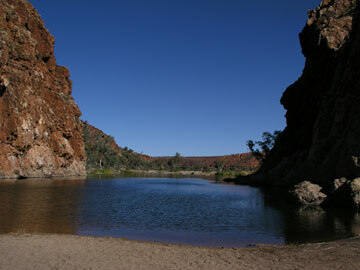 This is about 136 kilometres from Alice Springs. This is even better than the other places. It has a very nice camping area but it was quite crowded. It is certainly worth staying a night but unfortunately we have not planned this. Next time I will stay here. 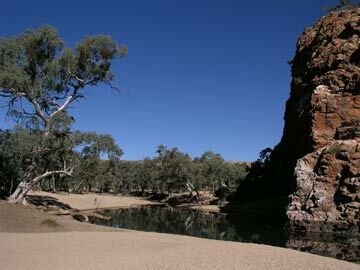 We then drive 11.5 kilometres to Glen Helen Gorge. This has a small resort and is a bit bigger than the previous places we have visited today. We then set out on the 130 kilometre trip to Palm Valley. The road has changed from what is shown on our map. There is a new section with some tar. 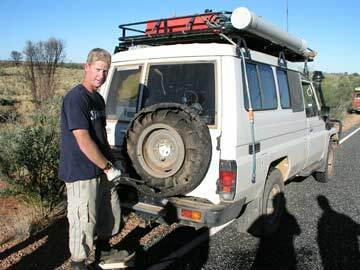 Along here Robby has a flat tyre just as we get on to the tar. The tyre was totally ruined. As we near Hermansburg, we take the track off to Palm Valley. It is 16.3 kilometres from the main road to the camping area. It is quite a rough road into the national park and we average less than 20 kmh. 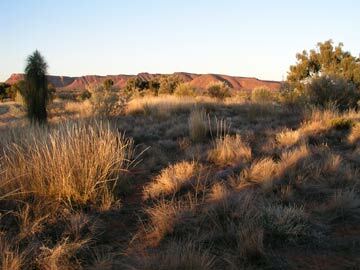 The track follows the ancient bed of the Finke River and is 4WD only and quite slow in spots. 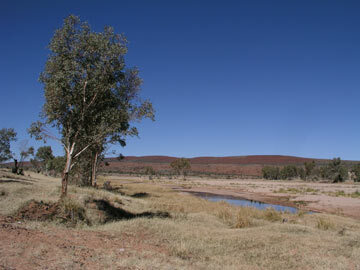 We collect fire wood just after we cross the Finke River. At Palm Valley there is a very nice camping area but there lots of people, at least 50 or more. The camping fee is about $12 and this includes hot showers. We did not arrive till after dark, at about 6:40 pm. After dinner, the local Ranger gives a talk. I only go to parts as I am cooking damper for dessert and due to our late arrival time, it is still being cooked. For dinner we had chicken and veges. In the morning we go to look at the palms and do a short walk along the creek. This is quite interesting. After the walk we have morning tea at the car park at the start of the walk. On the way out we see a 4WD bus bogged in sand but they are getting help from another vehicle. It is a very rough road to the palms from the camping area. We leave Palm Valley and head back out the same way we came in. 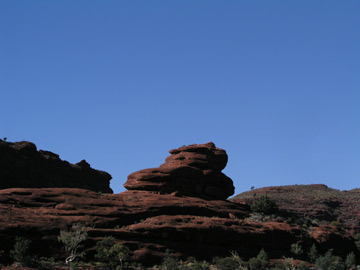 There is a very strange looking rock along the way that resembles the shoe from the fairy tale "The Old Woman and the Shoe". We turn right when back on the main road and go to Hermansburg. This is the site of an old Luthern mission. It cost us $5.50 to enter the small museum. 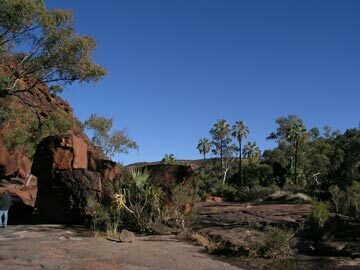 This was where the famous Aboriginal painter, Albert Namatijira, was born and raised. We look at a video, there is a good history on show and nice old buildings. There are two Albert Namatijira paintings and ones by other artists. 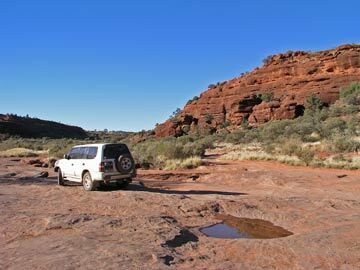 After leaving Hermansburg, we head off to Kings Canyon via the Meerinie Loop Road. You need a permit to do this road as it crosses Aboriginal land. We got these in Alice Springs two days ago (you can now get from Glen Helen, Hermansburg and Kings Canyon). Along the way we have lunch by side of the road. 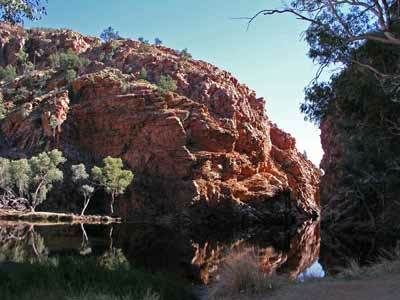 It is 198 kilometres from Hermansburg to Kings Canyon. The road is pretty good and we average 80 to 95 kmh for most of it, although the later bits drop to 70 to 80 kmh. It takes 3 1/2 hours, including our lunch break and a couple of sightseeing stops. When we arrive in Kings Canyon we refuel before going to the camping area. It costs $23 to camp for one night (with a discount for 8 people - normally $29!). This is a bit expensive and not worth it. Before dinner we go to the lookout to watch the sunset. There is a walkway and raised boardwalk to the viewing spot. The resort even sets up a stall selling champagne and beer to the tourists. We take our own! The sunset is quite nice, but not outstanding. Dinner is sausages and sate rice. 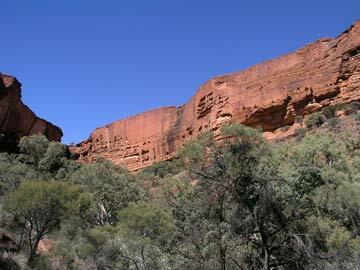 In the morning we drive the 10 kilometres from the resort to Kings Canyon. Here we do the Rim Walk. This is quite a hard walk. It goes right up and around the top of the canyon. 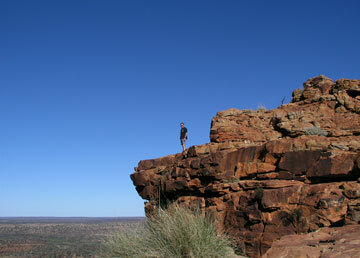 It is a fantastic walk, with spectacular views. It is very hot and we are glad that we have taken a lot of water with us. The whole walk takes 3 hours 10 minutes. Frank hurt his ankle on the walk when he twisted it. This will cause him problems for the rest of the trip. Back at the car park, we have lunch. After lunch we do the canyon walk. This is very easy and goes right up the centre of the canyon. 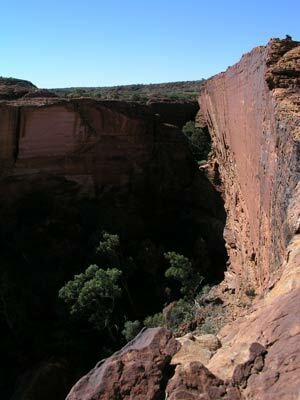 It has some great views of the cliff faces of Kings Canyon. This walk takes about 30 minutes. We then met the others at Kathleen Waters. They had gone there for lunch but Frank and I wanted to do the canyon walk before leaving. 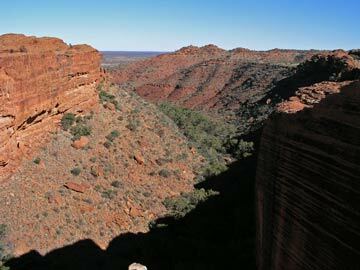 We drive the almost 40 kilometres from Kings Canyon to Kings Creek Station. This is a working cattle station which has set up a tourist resort on the side. It has a very nice camping area ($23) as well as cabins and fancy tents. It is a much nicer camping area than the one at Kings Canyon. Frank and I have a beer or two at the bar. That night we have a good fire and after, Frank and I go next door (to a permanant set up of tents for a bus group) speak to the people here. They have a better fire than we do! There are people from all over the place, France, Italy and Scotland and it is interesting to hear their experiences on their trip.